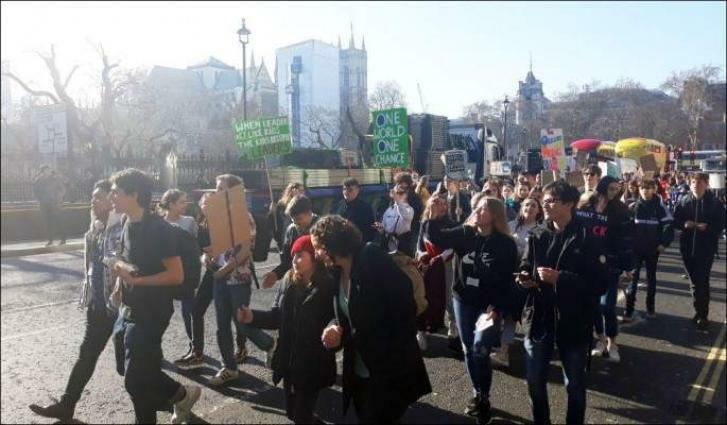 MOSCOW (UrduPoint News / Sputnik - 16th April, 2019) "Desperation" is driving the climate change protests in London, now in their second day, as the UK government has so far "gone seriously in the opposite direction" on the environmental crisis, Donnachadh McCarthy, the founder of the Climate Media Coalition and member of the eco-activist group Extinction Rebellion, told Sputnik. "It's desperation. It's terror. People understand that the United Nation's Secretary General have said we have 18 months left to start cutting radically our carbon emissions and there's absolutely no sign of that happening from any government in the world ... The UK government has consistently said they're in favor of climate action, but from a whole range of issues from cutting back on fossil fuels to almost banning onshore wind to trashing the solar industry ... they've gone seriously in the opposite direction," McCarthy said. McCarthy added that stopping climate change was only one half of the issue, with the destruction of the Earth's biosphere and animal life as another serious challenge facing the humankind. ""In my lifetime, I'm 60 years old, and 60 percent of nature that was on the planet when I was born is gone. It's going at like one percent a year, so in the time from my birth until the time I die my generation may have eliminated ninety percent of nature. It's absolutely horrific. To save the planet we need to change," McCarthy said. Activists are spread across four sites in central London, including Waterloo Bridge. The police have reportedly tried to lead protesters away from Waterloo Bridge they have been blocking, but the attempts have been unsuccessful. XR wants the UK government to bring carbon emissions to net zero by 2025 and to set up a citizens' assembly to monitor the implementation of climate change measures.